Spend a few days visiting Yerushalayim--Jerusalem. You’ll be amazed at how many languages you hear: English, Russian, French, German, Italian, Arabic . . . the list goes on and on. Oh, and Hebrew, of course! Israel is truly an international destination. Thousands of people come to visit each year. Some even come to stay! In Lesson 4, we’ll develop a rich vocabulary for talking about nationality and language. 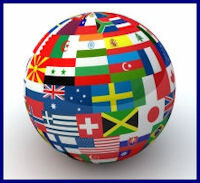 Then you can use the special Around the Globe game on this website to learn even more. So stick with us at Learn Hebrew Pod and come to visit us soon in Israel. Tell us where you’re from and what languages you speak. When we ask you, “ata medaber ivrit?” the answer is sure to be YES!